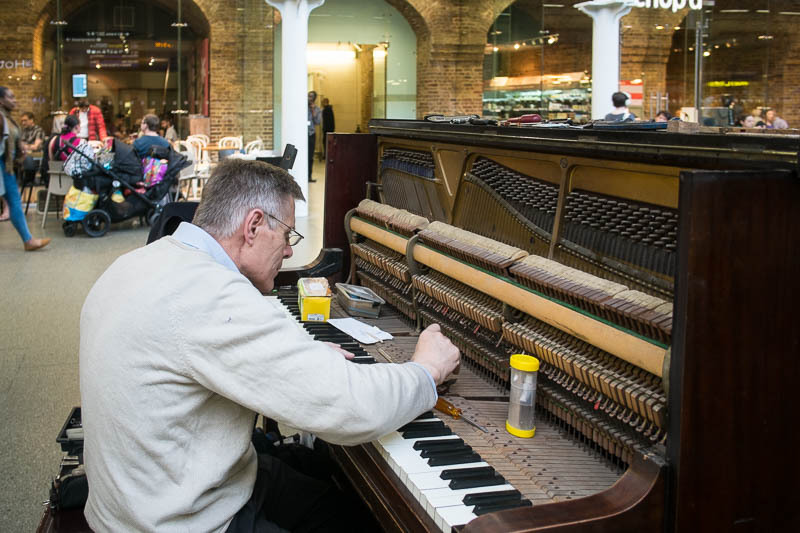 A few popular pianos dotted around the city during summer are now permanat fixtures, like the ones at St Pancras Station. We are treated to some wonderful music as we pass by. However this is the first time I have caught the piano tuner. My dad played the piano, so he had a tuner come once a year to give the piano a go-over. It makes me wonder who is paying for the maintenance or did that gentleman volunteer his services. How great for commuters, a little light music to arrive and depart too..
Looks like he is doing a good job. Good capture of the scene. I love the idea of stationing pianos around the city, though I have not seen any. And, they even keep them tuned! Great.